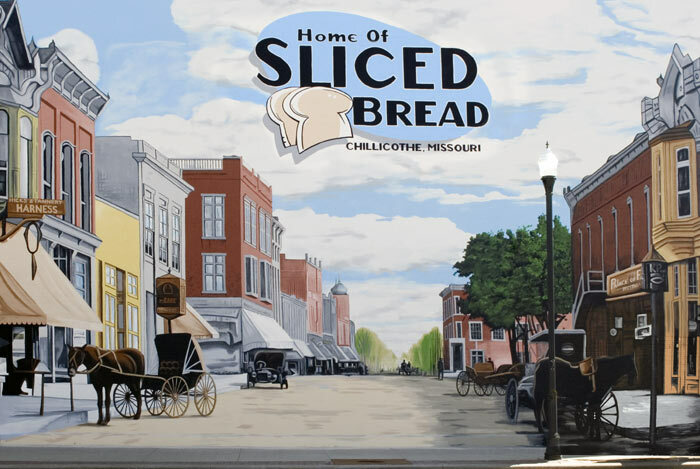 Chillicothe, Missouri, is the Greatest Thing Since Sliced Bread--We're the Home of Sliced Bread! Hello! You've heard of the "greatest thing since sliced bread," of course. Well, we have the real thing - sliced bread! 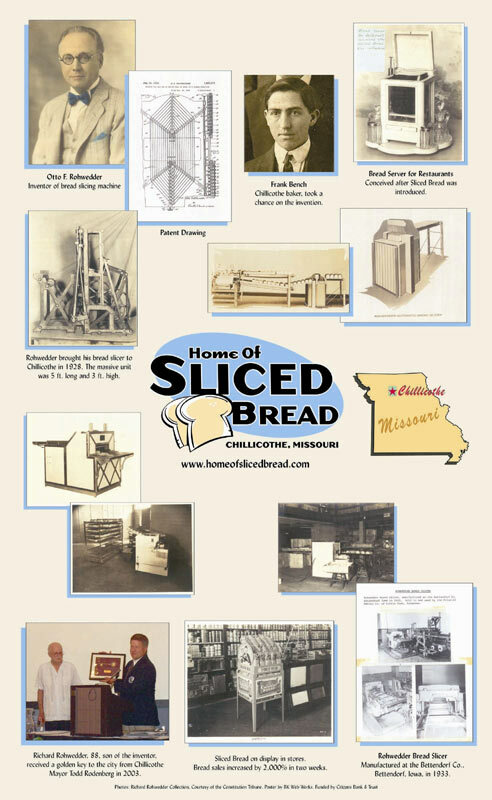 It was discovered that sliced bread was first offered for sale - ever - in Chillicothe, Missouri. 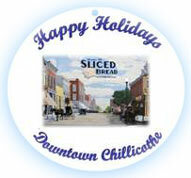 A product of the Chillicothe Baking Company, it was sliced on a machine called the Rohwedder Bread Slicer. Invented by Iowa inventor, Otto Rohwedder, the bread slicer was put into practice in 1928 in beautiful downtown Chillicothe. Our poster briefly outlines the history of sliced bread, and we created and produced a brochure for distribution. Click here to request a free brochure. Click here for the latest news! Smithsonian Bread Slicer Unveiled at Museum July 7, 2013! CBS Sunday Morning show features anniversary of sliced bread - July 7, 2013 - read more here! Reader's Digest magazine featured us in their Best of America 2013 - read more here! We hosted our first Bread Festival (BreadFest) in September, 2005. Souvenirs are offered for sale (see below). 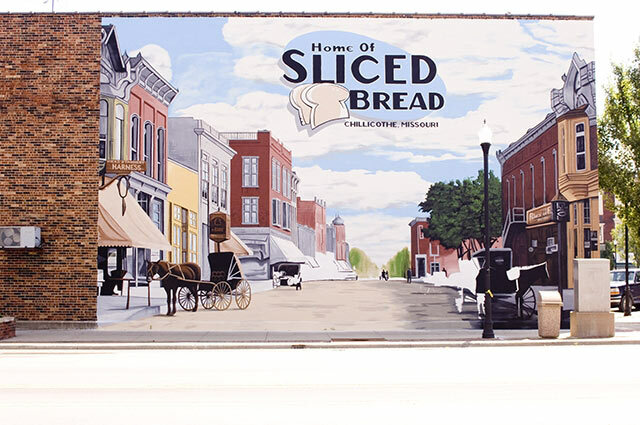 Enjoy our Home of Sliced Bread mural. There's lots "cooking" in Chillicothe, Missouri! Thank you for your interest in The Home of Sliced Bread. We are making plans for new souvenirs in the near future. Some miscellaneous Sliced Bread items are available for purchase at Main Street Chillicothe, 2nd floor, Chillicothe Commerce Center, 514 Washington Street. These include the ornaments, post cards, tote bags with the phrase, "I just brought the greatest thing since sliced bread," magnets shaped like a slice of bread with the mural image, and mugs with the mural image. For more information, call 660-646-4071 or e-mail Main Street. 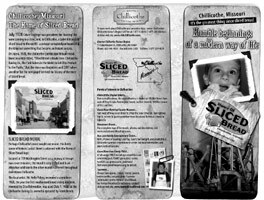 Our Sliced Bread Brochure... click here to request one. The first idea to "rise" from the committee was to find a logo. Entries were "kneaded" by February 1, 2004. Kim Ziegler of Chillicothe, Missouri, submitted the winning entry and won a $250 CASH PRIZE. Her logo is featured on the Home of Sliced Bread mural. You may see samples of all the entries we received here. See our logo entry form used in the contest which ended February 1, 2004, for more information about sliced bread. You may also email the webmaster with any questions. Entry form is in pdf format (portable document file). Adobe Acrobat Reader� (a free plug-in) is required to view the file. A small story that got front page billing in the Constitution-Tribune 75 years ago about a Chillicothe baker being the first to introduce sliced bread is now making headlines once again. Only this time, readers now know what kind of a profound impact his product has had on the world. And, hopefully, this time around the story will be remembered. Catherine Stortz Ripley, news editor of the Constitution-Tribune, rediscovered the article while doing research for a history book which the newspaper published in 2001. The original article was published on the front page on July 6, 1928. The headline: "Sliced Bread is Made Here. Chillicothe Baking Co., the First Bakers in the World to Sell This Product to the Public." The article was one that needed to be included in the history book, "Dateline - Livingston County," Ripley said. "I couldn't believe that something with such great importance had been forgotten," Ripley said. "You would think that the town would have capitalized on the fact that sliced bread was invented here." Finally, word is spreading about how the first machine-sliced bread was produced at Frank Bench's bakery located at First and Elm streets. A front page article appeared in today's Kansas City Star as a result of a reporter looking at the history book and is being picked up by other news media. Paul Wenske, a reporter from the Kansas City Star interviewed Ripley a couple of weeks ago about how she rediscovered the news article touting the invention of sliced bread. Bob Priddy, with Missouri Net News, contacted Ripley this morning (Tuesday) for an story to be broadcast this afternoon. Also, KFRU radio in Columbia, planned to do a live interview during its drive time show today. That interview, according to station manager Steve Thomas, can be heard on www.kfru.com. Ripley said that family members of Frank Bench have contacted her extending words of appreciation for making sure his story has not been forgotten. "Thank you for remembering my great-grandfather's younger brother Marion Francis "Frank" Bench Sr.," writes Nathan Haley, of Kansas City, in an e-mail sent to Ripley. Likewise, Debbie Colton, of Chillicothe, extended words of appreciation for remembering Bench, who was her great uncle. Haley provided a couple of articles published around the 1970s in the Constitution-Tribune relating to sliced bread and its introduction in Chillicothe. The articles were columns written by the late Bill Plummer, who was a long-time news editor of the C-T. In the articles, Plummer wrote that Hattie Bench, widow of Frank Bench, said that Mr. Bench and a man from Iowa developed the machine and produced sliced bread, which until then had to be sliced by hand in home kitchens. Bench and his partner had patented the machine, but while they "kind of waited" figuring out a wrapping solution, a man from St. Louis picked up their idea, changed the machine a little and started manufacturing slicing machines and turning out sliced bread.